An international group of researchers led by the University of Granada (UGR) has proven that the greater flamingo (Phoenicopterus roseus) facilitates microbial 'filtering' of organic matter in saline wetlands, thus improving water quality and reducing nitrogen loads by promoting denitrification. This is a facilitating role these animals possess which was unknown until now. UGR researchers Gema Batanero and Isabel Reche, along with their colleagues from the Doñana Biological Station-CSIC, the Nature Reserve Laguna de Fuente de Piedra, the University of Twente (Netherlands) and the University of British Columbia (Canada), have analysed the influence of flamingos in microbial processes at the Fuente de Piedra lake (Málaga, Spain) during a wet and a dry hydrological year. In words of Isabel Reche, "saline wetlands are extremely productive ecosystems that act as natural filters by mineralizing organic matter and reducing the load of organic nitrogen they receive. This 'purification' function is carried out by the microorganisms present in their water column and sediments and, with it, they improve the general quality of the water and reduce the nitrogen load by promoting denitrification". Besides, wetlands are the refuge and breeding site of countless waterbirds such as the greater flamingo (Phoenicopterus roseus) that inhabits the Fuente de Piedra lake. The effects that waterbirds may have on the wetlands' microbial activity were unknown until now, though. In the Mediterranean biome, as a consequence of climate change, it's taking place a reduction of wetland areas and the length of their hydroperiod. 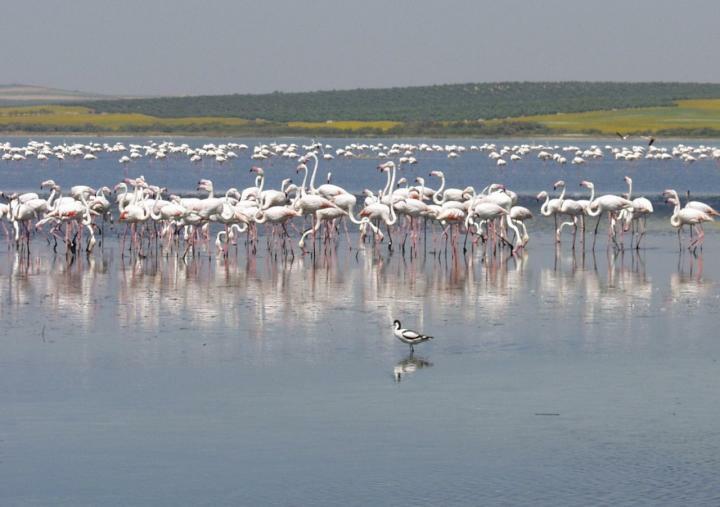 "This fact, along with conservation policies on waterbird densities and flamingos exploiting alternative artificial habitats such as ricefields and fish ponds, has caused an increase in flamingo populations in southern Spain", the UGR researcher remarks. Waterbirds in general, and especially flamingos, input nitrogen and phosphorus (N and P) in wetlands by means of their feces. Moreover, they stir the sediments. "Mass aggregations of birds may have a negative impact, promoting water eutrophization by means of their guano input (guanotrophication), since microorganisms need bioavailable N and P for the mineralization of organic matter", says Reche. Therefore, establishing the total load of waterbirds a wetland can accommodate without the occurrence of guanotrophication but promoting 'filtering' microbial activity is essential for a good management of the wetlands. "A management that ensures the maximum number of birds recommended, depending on meteorological conditions, without negatively affecting water quality". The researchers, whose work has been published in the Scientific Reports journal, have proven that flamingos promote bacterial activity triggering cascading effects on prokaryotic (bacterial) abundance and viruses. That stimulus occurs only during wet years, when both flamingo abundance and water level are high. On the contrary, during drought years, flamingo populations are greatly reduced and, even though N and P evapoconcentration occurs, the absence of bioavailable soluble phosphorus produced by flamingos has a negative effect on microbial activity at the Fuente de Piedra lake. 1. Batanero, Gema & León-Palmero, Elizabeth & Li, L.L & Green, Andy & Rendón-Martos, Manuel & Suttle, Curtis & Reche, Isabel. (2017). Flamingos and drought as drivers of nutrients and microbial dynamics in a saline lake. Scientific Reports. 7.